Handles for easy lifting and transportation. 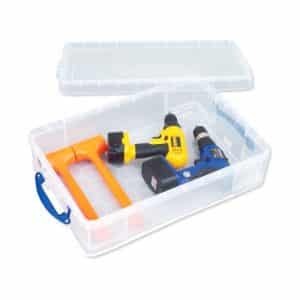 Complete with detachable lid with clip lock handles to keep contents dry and dust free. 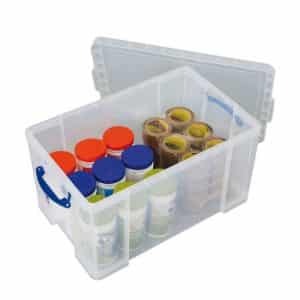 Stackable with or without lids offering a space saving solution. Flat honeycomb design reinforced base for increased rigidity. Reinforced corners to increase compression strength. Minimal draft angle on sides to allow increased storage capacity. (H)380mm x (W)440mm x (D)810mm. Complete with detachable lid with clip lock handles to keep contents secure. Manufactured in the UK from recyclable polypropylene. (H)430mm x (W)620mm x (D)810mm. Made from high impact polypropylene for improved strength. Higher resistance to rough environments. Reinforced corners and base for strength and durability. Keeps contents dry and dust free. Recess lid allows positive stacking for extra rigidity and safer storage. Minimal taper on the box to allow for maximum storage capacity. (H)310mm x (W)440mm x (D)710mm. Moulded lid guides to ensure non slip stacking. Clip-lock handles for easy mobility and content security. Transparent design so the box contents can be easily identified. Reinforced corners to increase comp. Holds 110 CDs or 180 DVD cases. Manufactured in the UK from clear polypropylene. Rigid reinforced base for increased load capacity. Lids feature – integral guides for non slip stacking. Minimal draft angle on sides to allow increased storage. (H)230mm x (W)440mm x (D)710mm. Clip-lock handles with tamper proof lid. Made from clear polypropylene for easy identification of contents. (H)315mm x (W)440mm x (D)610mm. Integral lip that accepts foolscap files. Complete with detachable lid with clip lock handles. Manufactured in the UK from transparent recyclable plastic for easy product identification. (H)310mm x (W)440mm x (D)520mm. 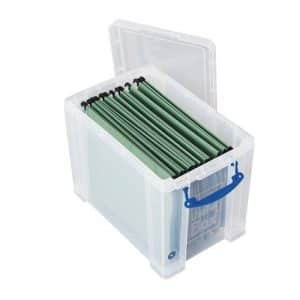 Store A4 or foolscap files . Integral lip allows suspension files to be hung. Complete with detachable lid with clip lock handles to keep . (H)310mm x (W)390mm x (D)480mm. Honeycomb reinforced base for increased load capacity. Strengthened corners and box base. (H)165mm x (W)440mm x (D)710mm. Detachable lid with clip lock handles to keep contents secure. Detachable lid with clip lock handl. (H)155mm x (W)400mm x (D)610mm. 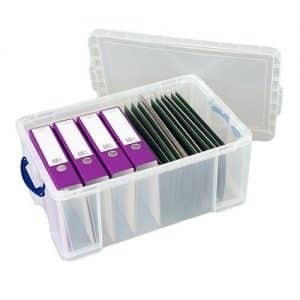 Foolscap files are able to be stored lengthways. Clear view plastic allowing items to be identified. (H)290mm x (W)270mm x (D)465mm. Detachable lid with clip-lock handles keeps contents secure and moisture free. 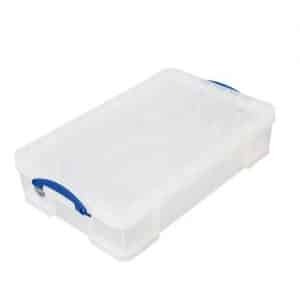 Detachable lid with clip-lock handl. (H)155mm x (W)255mm x (D)820mm. 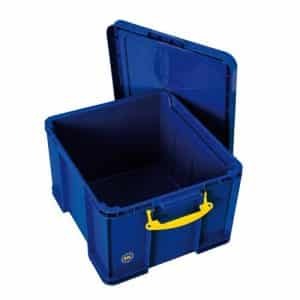 Really useful boxes are a fantastic brand of boxes. 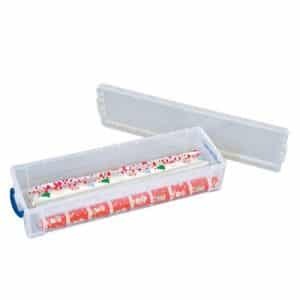 They are really strong and have a great seal form the lid which is easy to open and close. They are opaque so you can see what is inside or how full they are as well. We sell shelving units which are specifically designed to hold different sized really useful boxes and sell the boxes with them too. This means that you have everything you need for storage so you can put your items in the boxes, stack them on the shelving and everything is neat and tidied away. 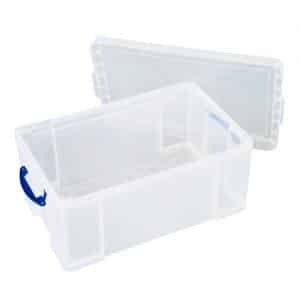 We have a selection of different sizes of boxes and shelving for you to choose from. We have a set of 16 x 24 litre boxes with shelving to hold four boxes per shelf with four shelves, or there is an option of 6 or 12 boxes with the appropriate sized shelving. 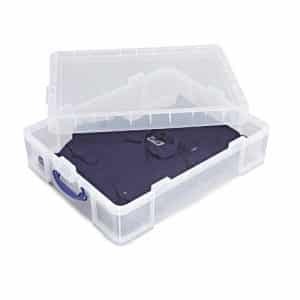 If you want less boxes but larger ones then we have a set of 6 x 35 litre boxes with shelving to hold them or we can supply 8 boxes with shelving or 9 boxes or 12 boxes, each with appropriately sized shelving units. We can provide 10 x 64 litre boxes plus shelving, 6 x 145 litre boxes plus shelving too. We also have 9 x 84 litre boxes with shelving as well as 6 x 84 litre boxes. The shelving that we can supply can be chrome wire shelving or more standard shelving. It is purposely supplied to fit the boxes exactly so they can be easily lifted on and off the shelves but are the right size so that they do not take up unnecessary space. You will get great quality boxes and shelving so you can be happy knowing that you will get the best value for your money.